WCLC provides students with the necessary support to assist them in reaching their academic goals in their public schools. We believe in encouraging students to embrace their bi-cultural American and Eastern backgrounds! WCLC has been recognized as one of the few institutions providing both language courses and educational assistance in strengthening the students’ academic standards in public schools. Due to our gaining acknowledgement by local communities, students from schools within the Walnut School District have chosen WCLC as their preferred after-school center! During class, students work both independently and interactively with the teacher and the assistants in fulfilling their schoolwork. Assistance is offered to help students reach their full potential in understanding the contents learned throughout their school day at their public schools. When possible, homework is reviewed by the instructors to ensure the students both understand the material and perform to their best abilities for their school grades. Aside from homework assistance, we provide students with additional instruction and practice work in English grammar, reading comprehension, and mathematics aligned with the standards set for the students’ appropriate grade levels. Additionally, WCLC provides preparation courses and practice courses to better prepare students for the CST state exams administered by the state. We not only strive to help students improve their academic performances and grades in their public schools, but also provide to the support they need to grow as excellent learners. Here at WCLC, we stand by our goal in providing the community’s youth with language instruction to help them embrace their culture and roots. 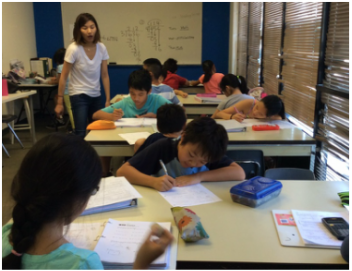 Our objective is for all students to learn to listen, speak, read, and write Chinese (traditional/simplified). We supply our students with appropriate Chinese language textbooks and material aligned to the students’ grade levels. During class, students will participate in fun and educational lessons, allowing them to work both independently and in collaborative peer groups. From the beginning of this program, students will progressively demonstrate their understanding of the Chinese language, culture, and history. Learning about their cultural roots shared among their peers helps to enrich their sense of identity within their communities. Every Friday afternoon, students partake in elective courses. Students can choose between taking writing workshops and drawing class. We believe in a rewards system intended to help encourage student learning and social behavior! All attending students will gather together for weekly announcements and participate in a raffle. Raffle tickets are reward to students with good behavior for the week. For details on tuition fees, transportation and registration, feel free to contact us!